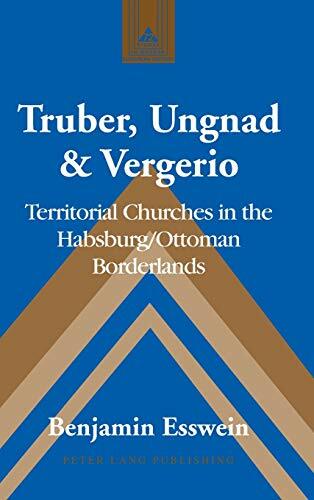 Truber, Ungnad & Vergerio: Territorial Churches in the Habsburg/Ottoman Borderlands provides a critical study of Lutheran reformers in Krain, formerly a province along what is now the Croatian/Slovenian border, and acts as a case study for the rest of the Habsburg-Ottoman borderlands. Focus is given to the Austrian Habsburgs, benefactors to the reformers, who sought to adopt Johannes Brenz' Lutheran "territorial church" model that would provide the Habsburgs the means to expand their hegemony over the region for decades. During this time, there were three individuals who were integral in establishing this movement: reformer and Bible translator Primus Truber, Lutheran diplomat Peter Paul Vergerio, and Austrian nobleman Hans Ungnad, the latter of whom played a central role in transmitting Slavic translation of Biblical and Evangelical texts into Krain through his personal network, which continued to help grow the Habsburg sphere of influence and contributed to their larger goal - keeping the Ottomans out. All three men established networks of support including notable moderate Catholics and Swiss Reformed, relying on their networks integrally to spread their faith and financially support them. The use of the Lutheran "territorial church" model signifies an attempt to establish a Lutheran confession and church regulation in Slovenian and Croatian lands by making them loyal to the regional reformer responsible for instilling Godly virtue and the true faith. Benjamin Esswein holds a Ph.D. in Reformation History from the University of California, Riverside and is currently Assistant Professor of History at Liberty University. This publication is the result of research done with a Fulbright-Mach Grant in 2011-2012 as well as help from the University of California, Riverside Graduate Program.